RSVP for our neighborhood picnic! Please join your neighbors at the fifth annual Hector Campbell Neighborhood Picnic. This year we will be gathering on the upper field of Campbell Elementary School, next to the Campbell Community Garden! Your neighborhood leadership team are planning a hot dog dinner with chips, potato salad, and lemonade. 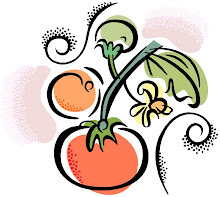 Campbell Community Gardeners will harvest fresh veggies to pair with dip seasoned with garden fresh herbs! RSVP's will help with planning how much food to prepare; those who RSVP will be entered in a drawing for prizes (you must be present to win!) To RSVP Leave a voice mail at 503-686-1826 or use the form at the bottom of this post. What to bring? The neighborhood association will provide all the food, drinks, and utensils. We will have some tables and chairs set up, feel free to bring a picnic blanket or lawn chairs. PLEASE leave your dogs at home. Monthly Meeting: Remember, this picnic is being held in lieu of our regular meeting! Our next meeting will be Monday September 9th, 7pm at the Public Safety Building. There was a recent arrest on drug possession and warrants prompted by the report of a suspicious vehicle in the area of the Sunny Corner Market at Home and Monroe. Capt. Bartol reiterated how important it is for neighbors to report suspected criminal activity or other issues at the time they are observed. He said the police will be doing extra patrols through Homewood Park as the weather warms up. The third Bike Giveaway will occur soon at local schools. This great community project is possible thanks to help from Sellwood’s Bike Commuter, Clackamas Fire District, Tri-Met and the effort in particular of Officer Billy Wells and Chief Jordan. Up to 50 children will receive bikes this year. Chief Jordan is helping to organize a fundraiser for Special Olympics called the Law Enforcement Torch Run. This will be on July 12th, starting at 9am at Riverfront Park and going south to the Oregon City Bridge, across to West Linn and along Highway 43 to Lake Oswego. Sponsors and participants are needed. Specialty police positions such as the Tri-Met position, Motorcycle officer, K-9 officer and School Resource Officer are open for competitive advancement. Some changes were made at the last Council session to ordinances relating to door hangers and noxious weeds and grass and weeds. In response to questions regarding the long-term parking on the street of vehicles without current tags, Capt Bartol replied that there is neither local ordinance nor state law that allows ticketing for this violation, but it is a factor that can allow officers to use the city’s abandoned vehicle ordinance to remove such a vehicle. He suggested that if this is a nuisance we might want to encourage Council to adopt an ordinance prohibiting this action. There is an ordinance that deals with inoperable vehicles on private property. Mr. Chaimov invited neighbors to contact him with concerns or suggestions for improvement of course offerings or other issues. He described in particular the course offerings and services at the Harmony Road campus. The campus has the only Army Strong program west of Michigan. It provides a number of occupational programs, especially the health training programs at the Harmony Road campus. The college would like to expand its health education offerings at Harmony Road. He also spoke about the County’s plan to build a road through the Three Creeks natural area which is just adjacent to the Community College’s property. He said that CCC does not want a road through Three Creeks. He, Councilor Hedges and Mayor Ferguson are working with the County to come up with a more acceptable plan that allows better access to the college campus without damaging the oak tree savannah or causing congestion or additional traffic in the Linwood and Campbell neighborhoods. One neighbor described problems he had encountered trying to register for a course as a senior citizen; Mr. Chaimov said he would check into it to make sure problems had been addressed. City Liaison Gary Parkin announced Earth Day events on April 20th (see City of Milwaukie website). Gary distributed the front page of the Pilot; the full version is available monthly online at www.ci.milwaukie.or.us. Volunteer Recognition Day is May 3rd at the City Hall conference room, 5pm. Rina Byrne has been appointed Finance Director from Asst. Finance Director and will continue to have contracted assistance from West Linn’s Finance Director as needed. There is waterline replacement construction work on-going on Harrison between 224 and Main Street. Other work continues throughout the Historic Milwaukie neighborhood to replace clay pipes. A questionnaire investigating neighbors’ views on the future of downtown Milwaukie is available online at http://www.ci.milwaukie.or.us/planning/fresh-look-milwaukie-downtown-road-map-community-survey. The Library is offering a credit for outstanding fines by donation of a can of nonperishable food from April 14-20th. This does not apply to lost book costs, however. The annual Junk Day will be June 1st. A coupon will be included in the May water bill. A grant has been submitted to the Oregon Marine Board for funds to help built a boat dock and ramp at Riverfront Park. Grant Request: The MHS Grad Party group has contacted Ms. Smith to arrange for the work party.at Homewood Park so they can earn the proposed $600 grant. Councilor Hedges: Council has been investigating strategies for placement of a bond measure on either the November 2013 or May 2014 ballot. The bond measure would raise funds for the Portland-Milwaukie Light Rail payment. Without passage of the bond measure painful cuts will have to be made in staff and services. Council is negotiating the contract with Wildlands, a company that brokers environmental credits and provides environmental clean-up, and which is the preferred provider to do the Kellogg Lake remediation and clean-up following the proposed removal of Kellogg Dam. ODOT is still investigating the feasibility of the dam removal. The contract with Wildlands lists a 10 year maintenance program, not in perpetuity, and it is not clear what costs the city might incur after the 10 year period, but it is thought not to be an issue. Treasurer’s Report – Linda Hedges reported that we have a balance as of April 7th of $8,547.49 in checking and savings. $2,243.12 of this amount is in the Campbell Community Garden fund. Linda reported that the NDA is required to submit an annual written report on grants provided during the year and plans for any funds left over. $8,670.42 was granted this past year, including $5600 toward Campbell Community garden and $1000 toward the police K-9 fundraiser. She will submit the report this week. Minutes from March 9th, 2013 meeting: Darlene Albertson moved and Wally Bischoff seconded a motion to accept the minutes; the motion carried. Transportation System Plan: The NDA Board of officers will be working on reprioritization of the projects as written in the 2007 TSP. Neighbors should contact David Aschenbrenner or one of the other officers if they have input for this report. There will be a public Open House on April 17th to discuss the review of the TSP and citizen input will be taken also at a June 3rd meeting. PSAC: Linda Hedges reminded that the Prescription Drug Turn In and Shred Day are combined this year on April 27th from 10am-2pm at the Public Safety Building parking lot. She reported that the video explaining the Photo Radar Van program will soon be available on the police department website, as well as one that explains traffic court procedures. Campbell Community Garden: Sarah Smith reported that only 1 plot remains in the garden. Already over 75 pounds of produce has been donated to low income housing and Esther’s Pantry, a food bank near Providence Milwaukie Hospital. The other community garden, Open Grounds, at St Paul’s Methodist Church on Linwood Avenue, will be providing produce to the low income housing apartments this year with community produce from CCG donated to Esther’s Pantry. 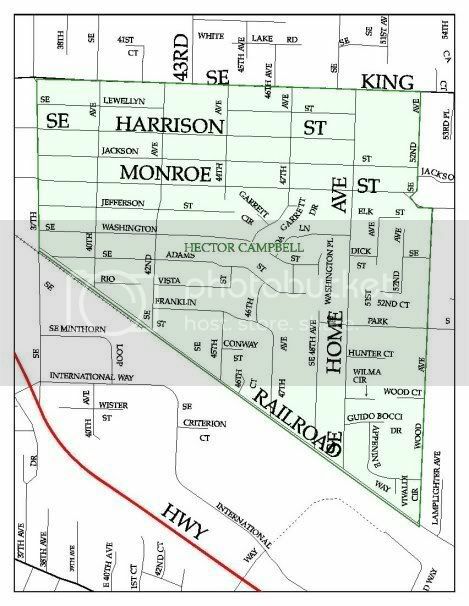 The city has asked the NDA to comment relating to the disposition of a property easement on the south side of Monroe and 44th. 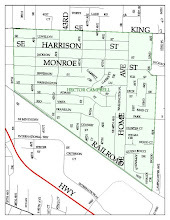 The property originally was to allow a road between Monroe and Jefferson but that road was never built and is no longer needed. The NDA considered the property for a pocket park or community garden but Monroe is too busy and has no sidewalks at this location to safely allow for neighborhood access to a park and any plans for expansion of our community garden would be onsite at Campbell school. Because the city is not allowed to sell the property itself, the best solution seems to be to return it to the property owners on either side for disposition and this was the recommendation by the NDA to the city. Linda Hedges made the motion, Wally Bischoff seconded. The motion passed; Councilor Hedges abstained. A neighbor mentioned that the road is being dug up for sewer work on 47th near where she lives, and she said she had advised the contractor that the road should be put back in as good a condition as when he started. May Elections: Mr. Aschenbrenner reminded neighbors that the May meeting includes annual NDA officer elections and encouraged those who have not previously been officers to step forward for Chair, Vice Chair, Secretary, Treasurer and PSAC Representative positions. Annual Neighborhood Picnic: Sarah Smith reminded neighbors that the Monday August 12th Annual Picnic needs helpers and asks those interested in helping to contact one of the officers. If anyone has ideas for the picnic also please advise. There was no further business. The meeting was adjourned at about 8:20pm.